The large machine shed is the first stop on the tour of the Bee Family Centennial Farm Museum. Visitors are encouraged to watch a 15 min DVD which introduces them to the four generations of the family that have made their living on the farm. It relates the family history to the agricultural history of the area. After a trip to Colorado in 1880 John Bee said that Iowa looked like heaven compared to the barren prairie of Colorado. Early farmers transformed Colorado history with the humble shovel. Irrigation displays in the back of the shed show how water is transferred from the rivers to make Colorado farm land some of the most productive in the world. This includes information on the Big Thompson Project and wells that have been dug on the Bee Farm. Guests can try their hand at throwing irrigation tubes and learn how a siphon works as well as the different types of irrigation that have been used on the farm. The Boxelder Creek runs along the northeast corner of the farm. During heavy rains it has historically overflowed its banks causing damage to the fields and crops. Arleigh Bee shares some of his experiences during the floods at the irrigation exhibit. There is also information on the crops: small grains, alfalfa hay, pinto beans, corn, and the importance of sugar beets to the economy of the area. This important crop was raised on the farm for 100 years. Though it required massive amounts of hand labor and equipment it was the main cash crop for the family. 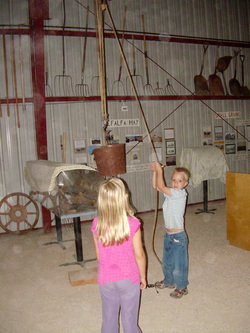 Children are able to lift a heavy bucket with a pulley, learn about the work on a farm in each season at the interactive exhibit called “A Farmer Works All Year”, and small children can play at the “hands on farm station”. Mechanization revolutionized agriculture. In the farm shop tools demonstrate how the work transitioned from horse power to tractor farming. Farmers needed a wide range of knowledge and skills to run a smooth farming operation. Antique tractors and trucks that the family used are also on exhibit.